Secreting excess salt—just as Marine Iguanas sneeze. A means of evaporative cooling—like the mosquito's behavior described here. An attempt to eject irritants from the crab's mouthparts. Possibly a means of self-defense. Any combination of the above or something I hadn't even considered. Has there been any research regarding the biological function of this behavior? On a side note, I'm curious about how widespread this behavior is—is it only this species or is it nearly all land crabs? And if all that wasn’t enough responsibility for these claws, they also are used for digging. While most digging crabs use their back legs to burrow backwards into the sand, the shame-faced crab uses the claws like little bulldozers, excavating the sand forward so the crab sinks downward until it is completely covered by the sediment. Burrowing underground is fine and all, but how does it then breathe? Again, it’s the claws that solve this problem as well. When beneath the sand, the crab regularly shoots a stream of water from its mouth (when you remove one from the water it spits for a few seconds, creating a little fountain that can be up to half a foot long. 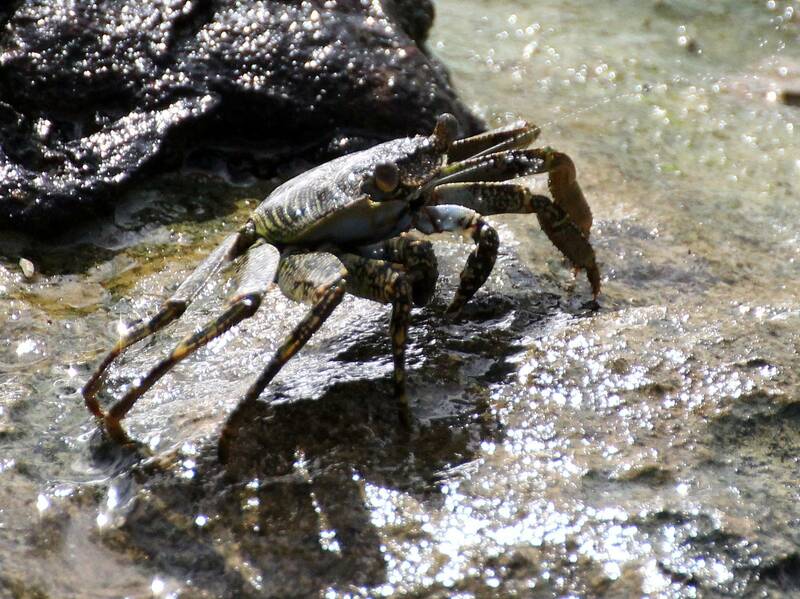 The crabs themselves are only about two inches thick.) The stream of water ricocheted off the inside of the claws, shooting upward and moving the overlaying sand grains, briefly allowing the crab to take a breath. Born much darker (almost black) in color as to avoid predation, Sally Lightfoot crab grows gains more vermillion, as it grows larger. Nimble-footed and photogenic,these crabs make for excellent models --though they may be a bit shy for close-ups, scurrying away sideways, up slopes and even upside down. Occasionally you may see a crab “spitting” from near its eye. Actually,the stream of liquid you notice is the Sally Lightfoot crabs way of expelling salt water that seeps into its exoskeleton. Not the answer you're looking for? Browse other questions tagged zoology behaviour invertebrates or ask your own question. Are there any theories why such an imbalance in chirality of molluscs? Why do orcas eat only the tongue of whales, liver of sharks, etc.? Why do Guinea Pigs chirp / sing? Why do cats meow when they are adults?